to the thousands of animals that come to the SFAHS each year. Join us for a fun morning! Dogs are welcomed and encouraged to attend this event. Make sure you check in on time and follow the marked path. and always be on the lookout for bikers. Furriest Friend: Dog that sheds the most fur in a fixed amount of time. Sloppiest Kiss: Dog that cleans their owner's face of peanut butter the fastest. Where is Bark in the Park? Bark in the Park is located at Pasley Park. Pasley is located off East 26th Street and Southeastern. You will follow the road down to the parking lot and you will see the shelter where registration will be occurring. Is the registration fee per person or per family? The $25 registration fee is per person. Any child 12 and under can do the run/walk with a registered participant for free, but would not receive a t-shirt or goodie bag. If your child would like a t-shirt, you would need to pay the $25 registration fee and they would receive the t-shirt and bag of goodies that go along with it. Can my child come with me for free? Any child 12 and under can participate with a registered participant for free, but would not receive a t-shirt or goodie bag. Online pre-registration closes August 24th at 2pm. You may still register the day of the event. What does "Fund My Run" mean? Your friends and family can sponsor you while you walk or run the 2k or 5k. This counts as your registration fee. You must raise at least $25. Do I have to have a "Fund My Run" page to participate in Bark in the Park? No. If you would rather just register, that is available as well. Follow the link above under Registration and click the "Register" tab instead! Do I have to sign up alone or can I sign up with a team? You can do a personal fundraiser or team fundraiser. You'll have a chance to select one once you follow the link under registration! How do I make my Fund My Run successful? Share! Tell all your friends, share on all your social channels and get out and promote your fundraiser for Bark in the Park! When do Fund My Run pages close, prior to the event? Any Fund My Run pages that are currently set up, you can collect donations until 4pm on August 24th. 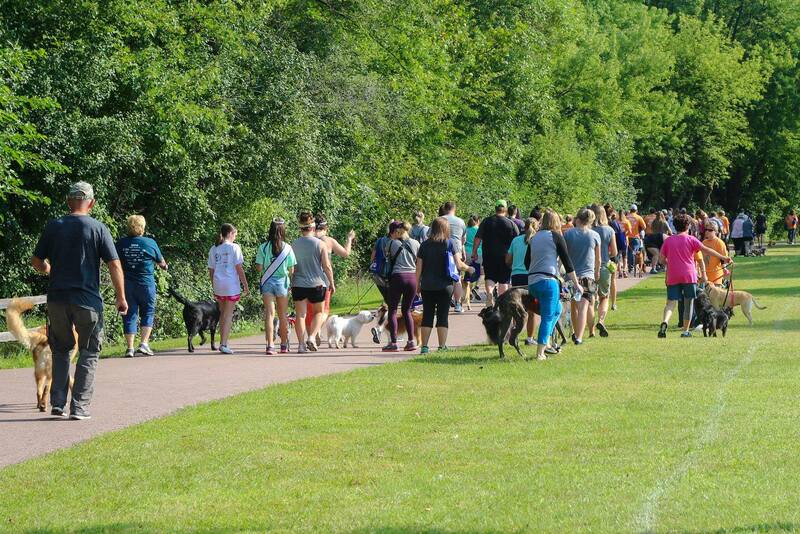 If your Fund My Run page has not collected $25 or more, you are still welcome to come to Bark in the Park, but will need to pay the $25 registration fee. Please bring all donations you have collected with you. If you have received a registration form in the mail and accepted donations offline, please bring that form with you as well! Yes, we will have registration open the day of the event. Pre-registration ensures you will receive a t-shirt in your size. We cannot guarantee we will have your shirt size the day of the event. - Cash and check donations along with a completed donation tracking form for any donations made offline. Dogs are welcomed but not required! Everyone is welcome to join us. If your dog does not enjoy the company of other dogs or a lot of people, it is probably a better idea to leave them at home for this event. The walk is a 2K which is equivalent to a little over a mile walk. The run is a 5K which is equivalent to a little over 3 miles. If you wish to walk the 5K instead, you are more than welcome to. Can I bring my cat, horse, or other animal? Bark in the Park is a dog-focused event. While we love all the animals, we ask that you leave your other animals at home for this event. What vaccinations does my pet need to attend Bark in the Park? While we don't require you to bring proof of vaccinations, we do request your pet be current with Distemper/Parvo combo, Bordetella and Rabies. Do I need to have my dog leashed? Yes. We always recommend you use a 4 to 6-foot nylon or rope lead. Flexi/retractable leashes don't typically work well in crowds. Harnesses are also a great option for this event. Can I drop my child off, so they can attend the event? All children that are 15 or younger must be under direct adult supervision at all times. SFAHS staff or volunteers do not count as the adult supervision required. If it rains the day of the event, we will reschedule the event. We will place announcements here on our website, our social media and news outlets. We do not have any food or beverages available at the event. There will be donated bottles of water available.